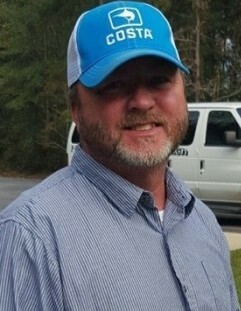 David Franklin Floyd, Jr., 47, of McRae, died Tuesday, September 18. A funeral service will be held at 2:00P.M., Thursday, September 20, in the chapel of Vaughn Funeral Home with burial at Telfair Memorial Gardens. Visitation is Wednesday, 6:00-8:00P.M. A Telfair County resident, Mr. Floyd was the son of David Franklin Floyd, Sr. and the late Brenda Joyce Long Coleman. Self-employed in residential construction and a truck driver with Thom’s Transport, he had served in the National Guard and was a member of The River, formerly Holy Ground Outreach of Eastman. Mr. Floyd was preceded in death by a brother, Dale Herman Floyd. Survivors include his wife of 30 years, Tammy Burch Floyd of McRae; father, Dave Floyd, Sr. of McRae; step-father, Tommy Coleman of Cadwell; children, Jamie (John) Bush of Hazlehurst and Matthew William Floyd of McRae; sisters, Toye (Bennie) Benton of Bolton, NC and Tonya (Mike) Sokoloff of SC; and brother, Damon Coleman of Eastman. Sisters-in-law, Tina Scott and Lisa Holder and several nieces and nephews also survive.